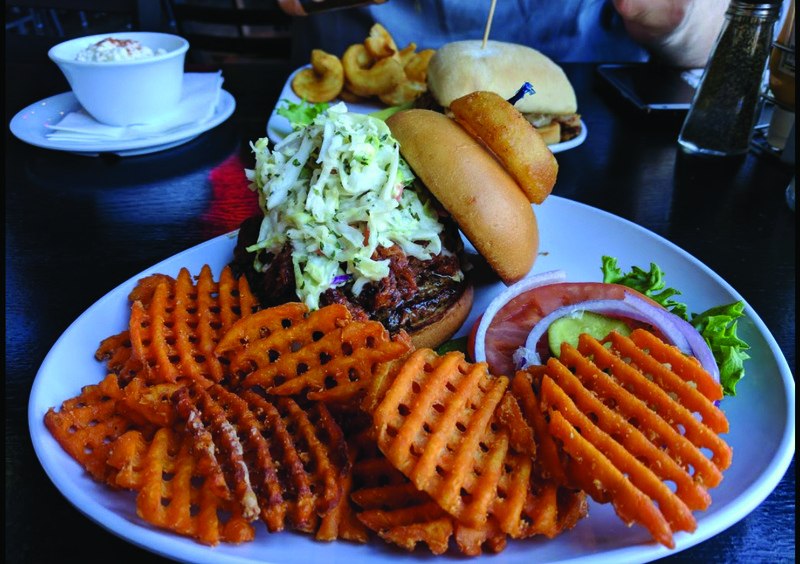 The Barrel House menu contains appetizers, sandwiches, wraps, soup and salads, burgers, tacos, pizza, and sides. They also have a lunch specialty where you can pick one item and two sides for $8.95, like their Cali Avocado Chicken wrap, a cup of soup and their Barrel fries. They also have wide range of alcoholic beverages. I visited during the half-priced appetizers (from 9 p.m. to midnight) and ordered chicken wings. This was a great choice – they were both crispy and flavorful. Someone at the table shared their soft pretzels and onions rings. Both were really tasty, and the jalapeño queso sauce for the pretzel was versatile and could be paired with fries or the onion rings as well. Someone else ordered the French Fry Nachos and ever since seeing them, I have been hoping to go back and try them! They came topped with cheddar and jack cheese, sour cream, jalapeño con queso sauce, sliced jalapeños, apple-wood smoked bacon bits and scallions. Loras Sophomore Jenna Roskopf has also enjoyed the times she’s eaten at the Barrel House. I will definitely be visiting Barrel House again, and it might very well be for their Sunday Brunch special. It looks like a reasonable deal for the food they will serve. Barrel House is open all week long from 11 a.m. to 1 a.m. but continues to serve drinks until 2 a.m. They have catering and delivery options as well. Their Dubuque location, one of six, is on the corner at 299 Main Street.